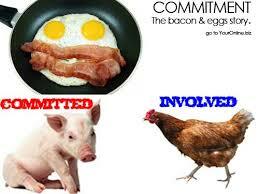 The chicken is involved, but the Pig is Committed . Furthermore, Bill W. worked his entire program with Ebby T. in less than 7 days and immediately started working with other alcoholics. Ebby T. was only 60 days sober when he carried the message to Bill W. and Dr. Bob was only 2 weeks sober when he and Bill W. carried the message to A.A. number 3, Bill D.
Moreover, these men didn’t wait around waiting to be asked by someone to sponsor them. Bill and Lois abandoned their lives with enthusiasm at the idea of working with other alcoholics. Bill W. and Dr. Bob frantically went searching for other alcoholics to work with. It’s all in the Big Book. In fact, it mentions 124 times in the first 88 pages of the 3rd edition of Alcoholics Anonymous, to work with another alcoholic. The agreement is that you have worked the Steps in a sufficient manner to bring about a spiritual awakening, and now are in a position to share that experience in an ongoing basis with someone else who is trying to attain and maintain long term recovery. Thus, both are afforded the opportunity for an extended sobriety. 12TH Step work in this neck of the woods has all but dried up. Inter group has a waiting list of 250 names actively seeking to engage in the work when the desperate reach out for help. It seems the Rehabs through aggressive marketing have captured the calls that would have come our way; do you find this scenario being played out in your area? Would it make a good sense to offer the services of interim or temporary sponsors as well as offering to bring the meetings to the local rehabs since they have already gone through the trouble of herding in the sheep? Until we have spoken with complete candor with someone and they have done the same with us, we still didn’t belong, Step Five was the answer it was the beginning of a true kinship between God and Man. Not only are we to SPEAK a Fifth Step, we are also to HEAR a Fifth Step. Who hears a Fifth Step? In most instances, a sponsor, so until you have heard a Fifth you still did not belong. You were circling the field waiting to run out of spiritual gasoline, and then it’s another crash and burn, Vern. When hearing a Fifth Step becomes an agreed rite of passage, things will start to change. I believe that when folks get enthusiastic and creative in finding a prospect and working with him, the recovery rates will begin to mirror what the pioneers had experienced. When a Grapevine cover reads “Haven’t Heard a Fifth Step, Still Visiting? Then you know you were on the move. It’s a group conscience agreement as the each group is autonomous. Someone stands up and makes the proposition to the group and follows through. Nothing spreads faster than success. As one group finds a workable format, the other local groups will follow suit. My experience is that a competition to get to the rehabs, hospitals, shelters and missions would not be far behind. Sure, it’s a great concept. Once we get our foot in the door, this will increase the productivity of the local rehabs, while lessening their work load and provide higher rates of recovery. It’s a win-win and the chances are better than slim. Any new idea is first met with ridicule, then, violent opposition. When the violent opposition passes away, it is accepted as being self-evident.